I hope you will watch it because I think it is one of her best videos! Thank you, SueReu, for the beautiful video!! very much! And Thank You, CANN! Love going back in time watching these videos. No one sings "This is the Moment" like Clay. Thanks Musicfan and SueReu! What a marvelous video! Not just beloved memories but also things I haven’t seen before (like that campaign speech, or outside with newborn Parker), and this one brought tears as well as smiles, for me. Kudos over and above, SueReu!! Thank you so much, musicfan, for always finding such treasures and sharing them with us. It always cheers me to start the day with CANN… I can’t always reply, but I haven’t missed a one, ever, lol!! Thanks so much for this wonderful video. The best part was saved for last – Clay holding his dear little baby boy, Parker, in his arms. Thanks again Musician and SueReu for all the joy this video brings. Loved this video thank you for sharing this with us. Tears in my eyes as I listen to Clay sing. 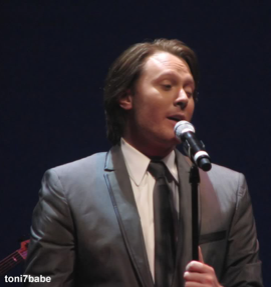 I miss his performing and his wonderful voice! Thanks for posting some wonderful memories. changed it. Grrr…… I hyphenated it this time. Sorry for the error! Error: Error validating access token: Session has expired on Tuesday, 21-Aug-18 16:13:01 PDT. The current time is Thursday, 25-Apr-19 23:51:27 PDT.